MedInstill has developed a safe and proprietary method. The Intact™ Sterilization has been tested using standard biological indicators (i.e. Bacillus atrophaeus, B. pumilus, Geobacillus stearothermophilus) used in the validation of other sterilization processes. 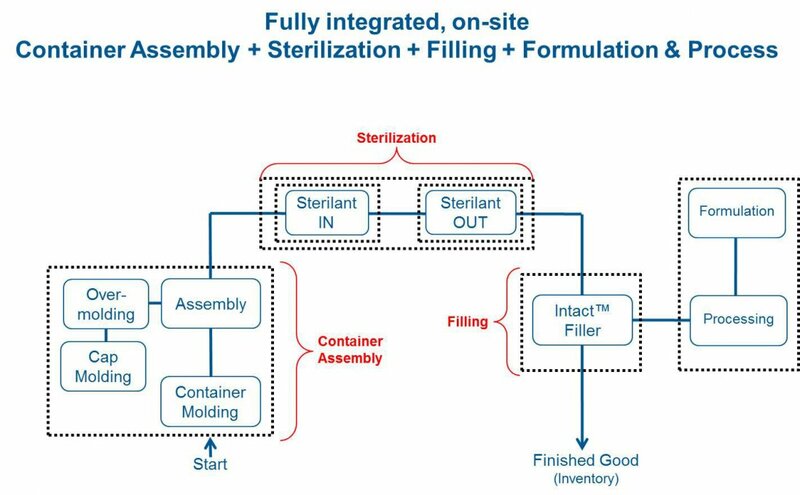 The MedInstill Intact™ Sterilization allows for a fully integrated, on-site filling process, from the container molding through the filling. Like any other sterilant, it requires adequate precautions during handling; however, such precautions are typical and universal. The sterilant is non-flammable. At the pressure and concentration used by MedInstill, it is classified as “not a special hazard”. It simply requires commonly used ventilation, control and personal protection measures found in manufacturing facilities. Sterilant is readily available from suppliers around the world. The cost of Intact™ Sterilization is significantly less than other sterilization methods.